DIY Hula Hoops – Tons of Creative + Active Fun for the Whole Family! Making Hula Hoops are a surprisingly easy DIY project for you and your kids. Once you make a hula hoop it may be hard to put it down – for both the kids and parents! Making them is very satisfying and you get to add your own creative touches to each one you make. But of course using them can be even more fun! So get going. Buy your supplies. Create your hoops. Challenge your kids! My family has made them and we cherish these great creations. We even made ones with my son’s 4th grade class so they could have them on the playground at school. The kids loved them! How To Make A Hula Hoop Here are a few great tutorials on DIY hula hoop creating & another DIY hula hoop creation. Using Your Hula Hoop Of course there is the age old hula hooping where you get the hula hoop to go round and round your body. You can get fancy and move it up and down the body, up an arm, over the head, etc. This all takes some practice for kids – and adults too. 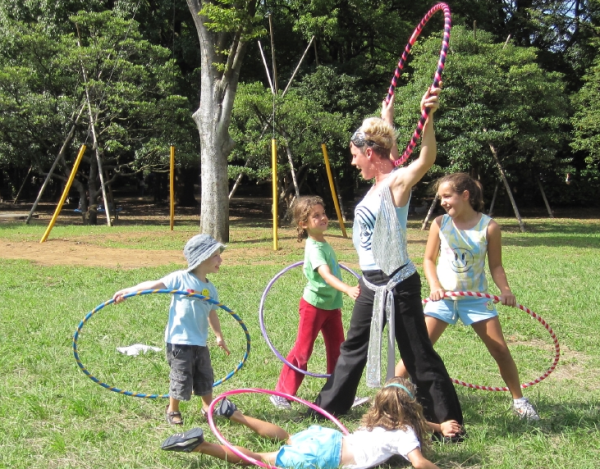 Here are some ideas of things you can do with your hula hoops that are fun for the whole family and don’t necessarily require the skill to do traditional hula hooping if that is not in the cards or you just want some fun alternatives. This entry was posted in Uncategorized and tagged #getoutside #getactive #activefamilies, Boulder, DIY, Families, Hula Hoop, Kids by Boulder Families. Bookmark the permalink.